Submitted by IPSC on Fri, 29/04/2011 - 16:40. 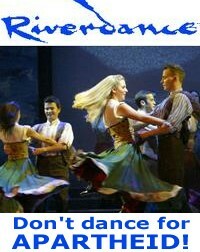 On 26th April two Open Letters were published concerning Riverdance's planned tour of Israel in September 2011. The first is from Irish artist Robert Ballagh who was the set designer for Riverdance, and the second is from Raymond Deane, Cultural Boycott Officer of the Ireland Palestine Solidarity Campaign. Extract 1, Robert Ballagh: "Because I have signed up to support the cultural boycott I will not be travelling to Israel with Riverdance ... I believe that this non-violent cultural boycott will contribute to the struggle for justice for the Palestinian people". Extract 2, IPSC: "Would Riverdance have toured South Africa during the dark years of Apartheid there? If not, then how can its creators and performers justify touring the rogue Israeli state that has devised its own form of Apartheid that in many respects is worse than that once practised in South Africa?"